The successive editions Paul Samuelson’s legendary textbook accurately capture the evolution of economic thinking over the second half of the 20th Century. It is the most obvious starting point to get a sense of the shift in consensus positions on many issues, including the viability of central-planning or the role of monetary policy. 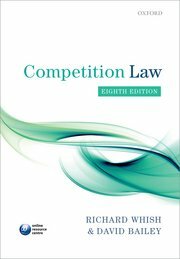 It is probably appropriate to say that Whish & Bailey’s Competition Law is our discipline’s Samuelson. It has been widely (and rightly) praised for its clarity and has long set (and still does) the standard for other textbooks in (EU) Competition Law (also when it comes to the jokes). As much as Samuelson’s Economics, it also reflects consensus positions. This is the reason why I open with excitement every new edition of Competition Law to spot changes in the text (and this in spite of the fact that it is each time a painful reminder of one’s old age). I received the 8th edition a few weeks ago (I have all editions from the 5th, with which I studied in Bruges). As I expected, there is a relatively lengthy discussion of Cartes Bancaires (pp. 125-127) and its impact on the textbook’s trademark framework, which revolves around the famous ‘object box’. The analysis of the Court in that case (and in previous ones, such as Allianz Hungaria) shows that the ‘object box’ approach is not always reliable. The discussion of this question in the new edition is in any event interesting and valuable. And there is no doubt that the ‘object box’ will help thousands of students to make sense of the underlying legal concept! Another key change comes in the treatment of exclusive dealing and loyalty rebates. The book used to take a marked normative stance on the question. In the past two editions, the author(s) expressed a preference for an effects-based approach to exclusive dealing. Similarly, they considered that the application of the ‘as efficient competitor’ test to loyalty rebates by the Commission could have a positive impact on the substance of the law. The 8th edition is remarkable in that it adopts a positive stance on these matters. The authors no longer dispute the current state of the law. They simply explain that exclusive dealing and loyalty rebates are prima facie prohibited and that it is for dominant firms to put forward an objective justification for their behaviour. The new edition is also a good reminder for students that there is no such thing as a per se prohibition in EU competition law. It is not difficult to guess what might be behind these changes. Wouter Wils’s article on Intel (announced in this blog) has had an enormous impact in the competition law community – it is probably the most read article of the past 12 months. Regular readers of the blog will remember that Richard Whish wrote an editorial defending the prima facie prohibition of exclusive dealing shortly after that article was published. The changes introduced to the new edition show, above all, that ours is a discipline in a constant state of flux. Some of my colleagues regret that the law in some areas has become so stable that there are hardly any interesting theoretical or practical questions. For better or worse, EU competition law is really far from reaching that stage. I genuinely thought – and I do not think I was the only one – that the Commission Guidance on Article 102 TFEU captured reasonably well the consensus around the appropriate treatment of exclusive dealing and loyalty rebates. It is now clear that such consensus does not exist, and may never have existed. From this perspective, Wils’s article played a valuable role, in the sense that it has prompted a vigorous (and necessary) debate on issues of principle. It is not a secret that I hold different views. But as a firm believer in competition, even (or rather, especially) when it comes to ideas, I am convinced that a more robust, consistent and sensible competition law system will emerge from this debate!